We’ve teamed up with Ecotricity to help you use greener affordable energy from renewable sources. Being Britain's greenest energy company is not just about the obvious stuff, Ecotricity's electricity is 100% green and their gas is fracking-free. They are the only energy company in the world to have EMAS accreditation. EMAS (Eco Management and Audit scheme) is the gold standard for environmental management. This allows them to track all their environmental impacts and target those for continuous reduction - and they report those impacts every year on their website. Ecotricity are not only building new sources of green energy but they are also working to halt the fracking industry in Britain, and are expanding the Electric Highway which is a groundbreaking network of electric car charging points. 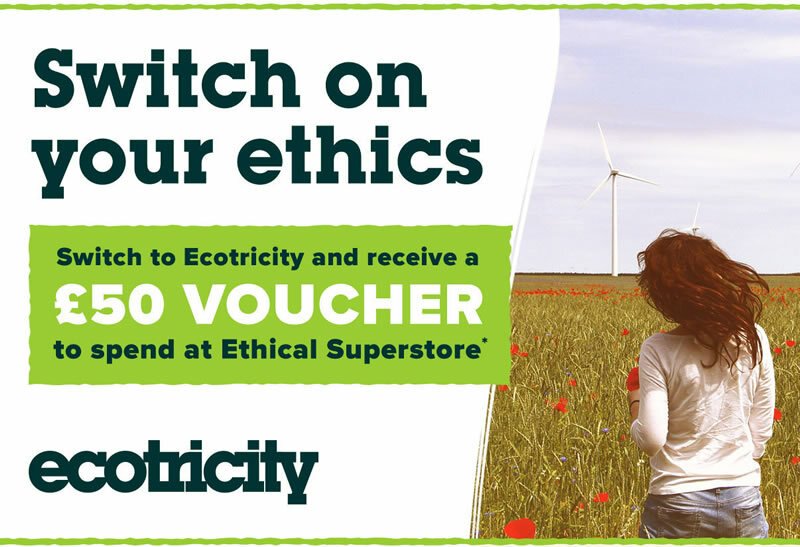 It’s easy to switch - it only takes a few minutes, and Ecotricity will do everything for you. Just call free on 0808 123 0123 or visit their website via our links above, and mention Ethical Superstore.